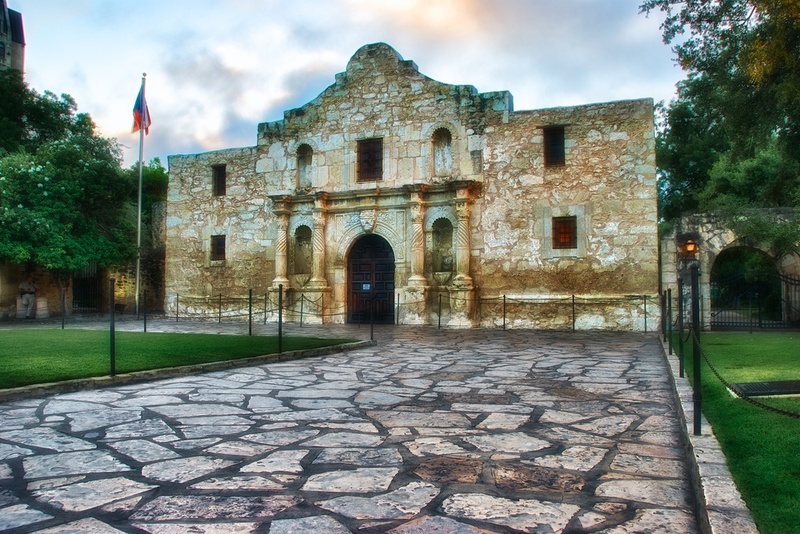 If you have ever visited San Antonio, there's a good chance you have seen the Alamo. It is one of the top tourist attractions in San Antonio and is pretty central to downtown so it is easy to go see. Having spent a big chunk of my childhood there, I have seen it many times, but being into photography these days makes you look at things a bit differently. My initial thought was to get the classic shot of the front entrance in all its HDR glory, but having arrived downtown later in the day the massive crowds forced me to rethink that idea. In order to get a shot without a bunch of tourists in it, I believe I will have to get there pretty early in the morning. So, having abandoned my original plan, I walked around the area and got quite a few shots of other parts of it, but kept returning to the front since I like that entrance so much (I am a fan of entryway shots). I finally ended up with this shot, which was not even in HDR. In fact, it came out fairly bland originally because the sky color was whitish-gray which basically matches the color of the structure itself. So I tried this shot a few different ways and ended up going with a sepia tone as you can plainly see. I like the idea of using sepia on "old stuff" because it often seems to work. I also spent some time in Topaz Adjust to bring out the details in the structure, and this is how that little project ended. If you are in the area, be sure and go pay this place a visit! Single exposure, f/7.1, 0ev. Converted to sepia in Aperture and utilized Topaz Adjust to accentuate some details.